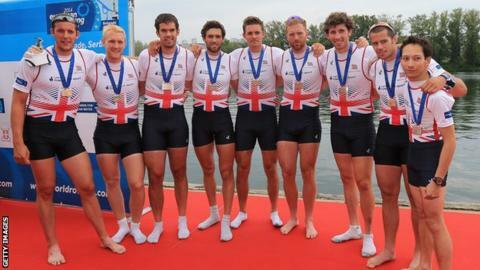 Great Britain's men's eight celebrate winning a bronze medal at the 2014 European Rowing Championships in Belgrade. Britain's men's eight are through to Sunday's World Championship final after winning the repechage in Amsterdam. Matt Tarrant, Will Satch, Matt Gotrel, Nathaniel Reilly-O'Donnell, Pete Reed, Paul Bennett, Tom Ransley, Constantine Louloudis and cox Phelan Hill beat Russia by three seconds. The crew features five changes from the one which won a historic world title last year in Chungju, South Korea. Britain's Vicky Thornley progressed to the women's single semi-finals. It was a largely successful day for Britain at the Bosbaan rowing lake with improved conditions greeting the rowers a day after racing was suspended because of a strong crosswind. The women's quad won their repechage to move into the semi-finals while the women's lightweight equivalent's victory moves them into the final. The men's double of John Collins and Jonathan Walton and the lightweight equivalent of Jamie Kirkwood and Will Fletcher finished second and first in their respective races to move into the semi-finals. However, the women's eight will have to contest the repechage after finishing second to the unbeaten USA crew in their heats. Thornley, racing in the single after her double partner was forced to miss the event with illness, finished third behind gold medal favourite Kim Crow of Australia and USA's Genevra Stone. The men's eight rounded off the day with a comfortable win, crossing the line in five minutes 41.75.